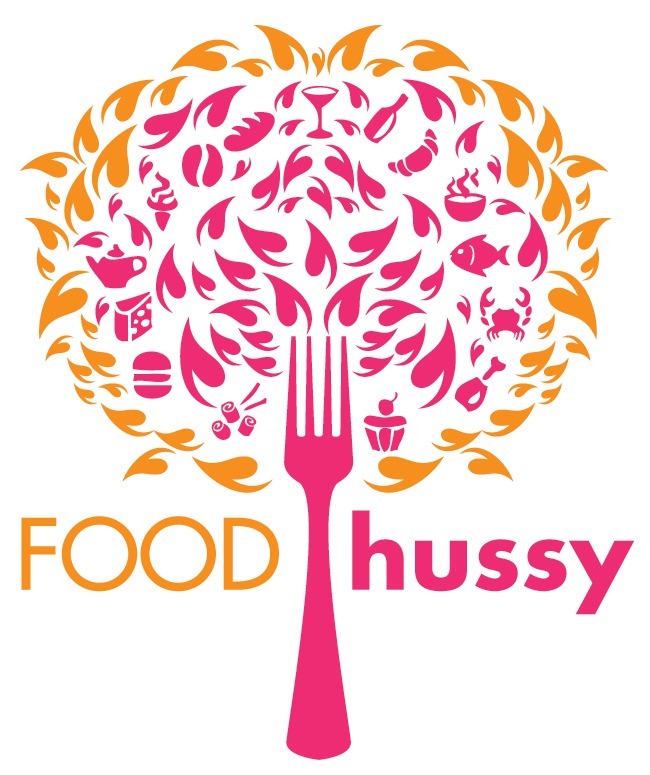 Recipe: Jarlsberg Dip Cheesy Potatoes | The Food Hussy! A few years back I made Jarlsberg Dip and loved it! It's a pretty popular item around here - Kroger carries it and people have it for every gathering. It's so easy to make too. After making it - I thought - hmmm - this would be really good with potatoes (like those cheesy potato casseroles)! And thus - Jarlsberg Dip Cheesy Potatoes were born! If you're not familiar with Jarlsberg - it's from Norway and is similar to Swiss cheese. 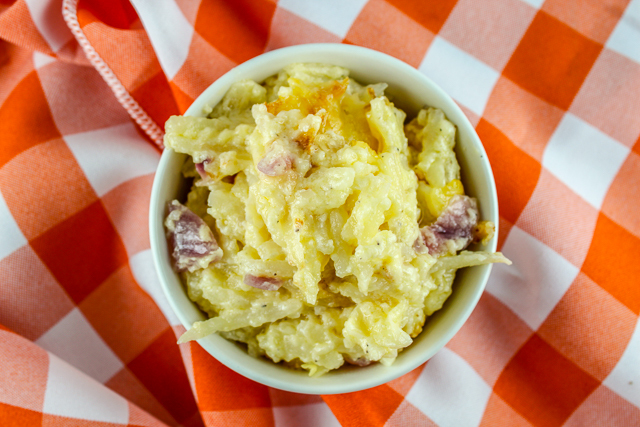 These potatoes are a fantastic side dish - especially with Easter coming up!! They'll be great with ham too! 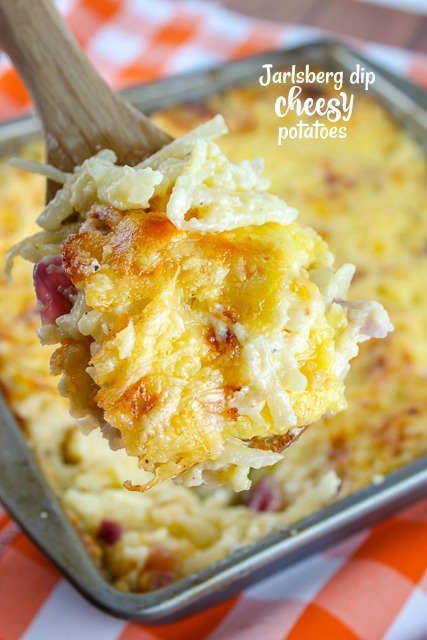 I loved these Jarlsberg Dip Cheesy Potatoes! The first time I made them - I literally just ate them for dinner - they were so good! And they're easy to make - I grabbed my big mixing bowl and poured everything together and then into the pan they went! Bake and done! You can also make these Jarlsberg Dip Cheesy Potatoes ahead of time and refrigerate or freeze for later! It's a great potluck dish too - I've been making so many great recipes lately - my friends aren't sure which one they want me to bring to Easter Dinner! They have to pick between the Pineapple Stuffing, the Sweet Potato Casserole and now the Jarlsberg Dip Cheesy Potatoes! 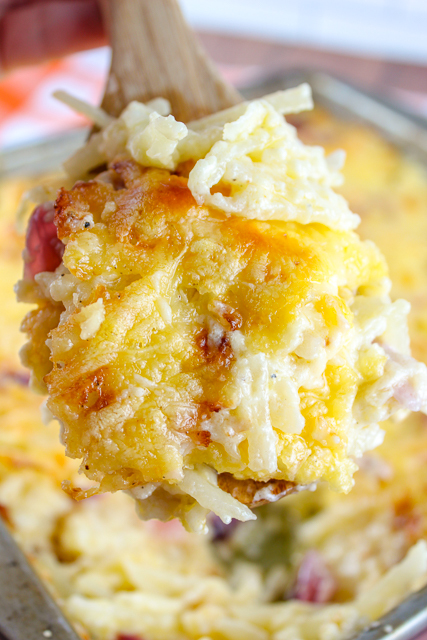 These Jarlsberg Dip Cheesy Potatoes are delicious! They take 10 minutes to put together and are so easy! I can't wait for you to serve these with your Easter dinner! (and then you'll be so hooked - you'll want them all the time!) Yum!!!! Jarlsberg Dip is very popular around these parts - so I made my own a while back. Now I decided to make that dip into a cheesy potato recipe! This is a perfect side dish for any holiday meal (or any meal really!). Your family will love it!!! Add hash browns and melted butter. Mix well. Top with remaining 1/2 cup of cheese and bake 5 more minutes. sounds delicious!!!! Adding it to the menu this week!